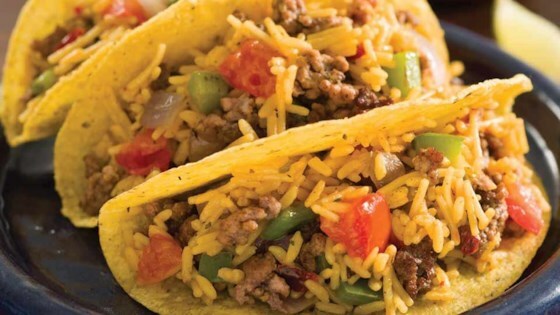 "These beef tacos with bell peppers, onion, and Mexican rice are quick and easy--just what you need after a busy day." Melt 1 tablespoon Spread in large nonstick skillet over medium-high heat and brown ground beef, seasoned with salt and pepper, if desired; remove and set aside. Melt remaining 1 tablespoon Spread in same skillet over medium-high heat and cook peppers and onions, stirring occasionally, until crisp-tender, about 5 minutes. Stir in water, Knorr(R) Fiesta Sides(TM) - Mexican Rice and tomato and bring to a boil over high heat. Reduce heat and simmer, covered, 7 minutes or until rice is tender. Stir in beef; heat through. Spoon into taco shells and serve, if desired, with lime wedges. Top, if desired, with your favorite taco toppings such as sour cream, chopped red onion and shredded lettuce. I had to add taco seasoning & garlic powder. plus I used yellow rice instead and it was remarkably tasty. The family ripped thru every bit of it. Excellent! Thanks for the recipe!